A Brown Dwarf with 2.5 larger mass than Jupiter and multiple orbiting moons (pic) is right now (2/11) exactly between the orbits of Jupiter and Mars on an inbound trajectory from south of the ecliptic plane from the Leo Constellation heading for a tight turn around the sun on Mercury's orbit line. March 4th, 2011 marks the day that the brown dwarf (info) breaks through the ecliptic plane into the northern hemisphere to begin influencing the earth into convulsions and severe spasms. Earthquake and volcanic activity will escalate from this time forward and increase like birthpangs where the earth groans and the oceans slosh tidal waves to and fro. March 15, 2011 is the first of three conjunctions where the earth is caught in the gravitational gradient lines-or the trough-that binds the sun and brown dwarf together. The sun will be pulling one way and the brown dwarf the other way and the predicted pole shift event will take place. The interesting thing about this particular day is that Saturn, the brown dwarf, the Earth and the Sun and Mars and Jupiter and Uranus are all in alignment. The astronomy people and the media should be talking about this alignment, because rarely do seven planetary and solar bodies line up in a straight line like we see on March 15, 2011. This gravity trough is going to be the mother of all where the planets are lined up for a game of Tug of War. The earth will be susceptible to the brown dwarf's magnetism and flip over to match the giant's polarity like a smaller magnet flips in space for a larger one. This is the reason why so many people are giving out warnings concerning the conjunction and pole shift on March 15, 2011. The magnetic poles are not shifting on their own at some near future time. They are being influenced and shifted gradually by the approach of Nibiru/Planet X. The Govt knows (FEMA preparing = US Govt Bunker Map) all of this and keeps people in the dark, because there is only so many spaces in their underground bunkers. The brown dwarf crosses the Mars orbit on June 30, 2011. Keep your eye on the earth and sun distances as we continue. August 3, 2011 marks the time that the earth passes through the brown dwarf perigee position, while the brown dwarf is crossing the earth orbit location. About two weeks pass and on August 18 the brown dwarf crosses the Venus orbit some 67 million miles from the sun. Then 24 days pass to the magical moment when the brown dwarf reaches the nearest point to the sun at 44.73 million miles. This right here is the reason that the Rothschild/Rockefeller Banksters (What Really Happened) and the Globalist New World Order Elites used Bush and company to plan and carry out the 9/11 inside job attacks on 9/11/2001 exactly ten years to the day. The banksters and their bought-and-paid-for corrupt politicians and lying media moguls are planning to hide themselves in underground bunkers all around the world and let the peasants fend for themselves. September 25, 2011 marks the time that the earth passes through the second conjunction with the sun, brown dwarf, Mercury, Saturn, the Sun and Uranus in line for another Tug of War. The sun, brown dwarf, Mercury and Saturn are pulling the earth towards the sun in an event that will bring the earth nearer to the sun than at any time in the last 3600 years. There are 14 days between the brown dwarf reaching perigee position and this conjunction with the earth and sun being equidistant to the dwarf on the 7th day. Look down in the lower left hand corner of the Sept. 25 diagram to see the brown dwarf is now nearer the earth than the sun at only 38 million miles. October 2 is the day that the brown dwarf crosses Venus' orbit again to begin trekking in the direction of earth. Our planet is still being pulled towards the sun, but by this time we are also being pulled forward into the massive gravity well. Two weeks go by and the brown dwarf crossed the earth orbit line to pass directly in front of our planet at just 22.3 million miles away, which is the nearest point in our encounter. The brown dwarf crosses the Mars orbit line on November 14, 2011 on way to the third conjunction on November 22 where the earth passes directly between the two once again like on March 15. Nibiru between Jupiter and Mars orbits. 2.66 AU from Earth. Nibiru breaks through solar ecliptic plane to enter northern hemisphere. 2.26 AU from Earth. Saturn, Nibiru, Earth, Sun, Mars, Jupiter and Uranus are in alignment creating gravity trough and pole shift event. First Conjunction. 2.09 AU from Earth. 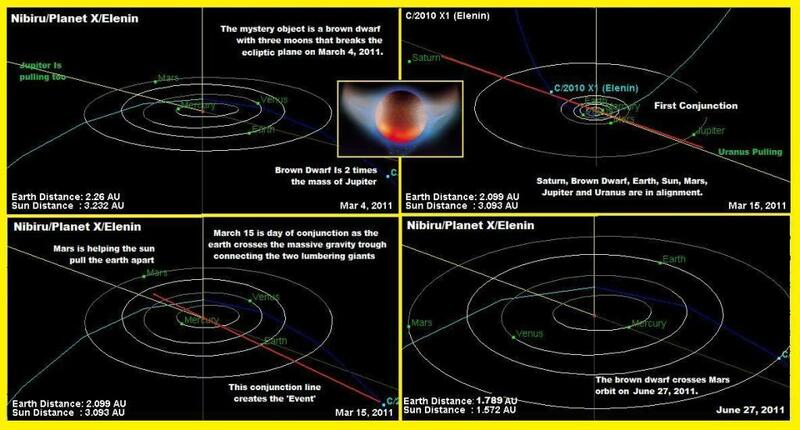 Nibiru crosses Mars orbit. 1.77 AU from Earth. Nibiru crosses Earth orbit and Earth reaches Nibiru perigee position. 1.48 AU from Earth. 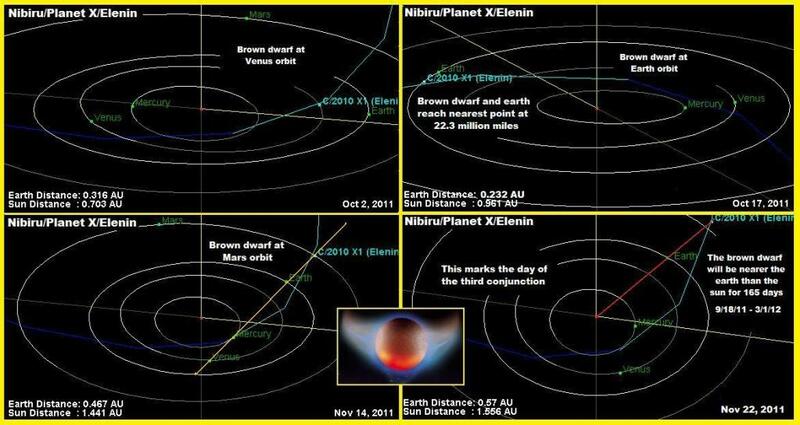 Nibiru crosses Venus orbit. 1.24 AU from Earth. Nibiru reaches perigee position at Mercury orbit. .70 AU from Earth. Nibiru equidistant from Sun and Earth. Second Conjunction. .40 AU from Earth. Nibiru at Venus orbit. .316 AU from Earth. Nibiru at Earth orbit and nearest position. .24 AU from Earth @ 22.3 million miles. Nibiru crosses Mars orbit. .47 AU from Earth. Nibiru, Earth and Sun alignment for third and final conjunction. .57 AU from Earth. 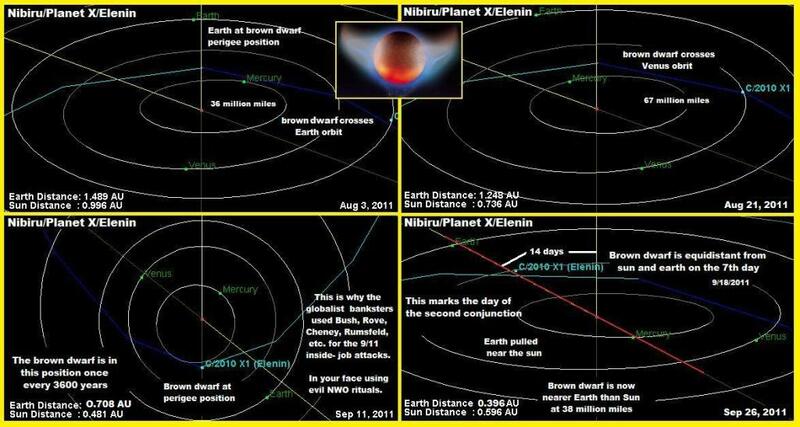 Nibiru will finally be farther from the Earth than the Sun on March 1, 2012 marking 165 days from Sept. 18, 2011 that Nibiru was nearer our planet than the Sun.